If you are looking for a technical job in a busy environment that offers a good life / work balance then this could be the role for you. 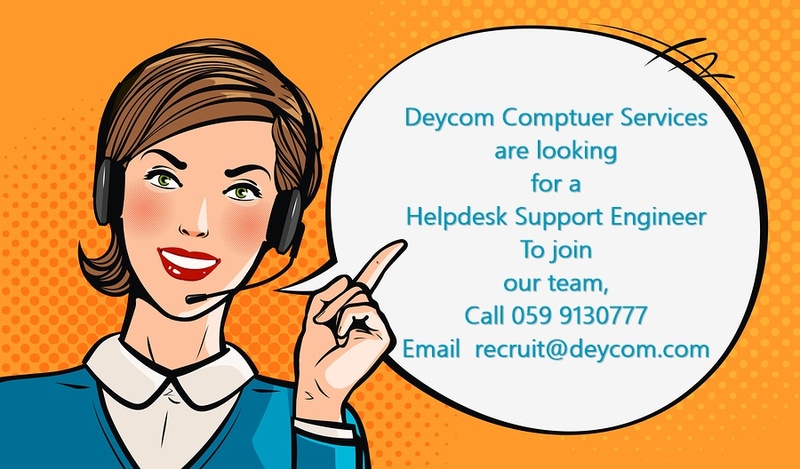 Deycom Computer Services is a well-established business that has been providing IT support to companies in the South East of Ireland for over twenty years. We have excellent relationships with all our clients and we are looking for someone who enjoys working with technology in a friendly environment to join our team. We provide IT support to a wide range of companies in the South East region and we believe it is our high level of customer service that has helped in our success. Likewise, we recognise that everyone in our team plays a key role in our success and therefore we always strive to ensure everyone’s work is rewarding and enjoyable as they develop their careers. We are looking for someone who has two+ year’s experience in an IT support role who is now looking to develop their IT support career. You will thrive in this role if you have previous experience as a field service engineer and you get a buzz out of resolving client’s technical issues. Ideally you will have technical skills in resolving issues with desktop computer, laptops, printers as well as some basic server experience. This role will suit someone who is always looking to learn more, who enjoys sharing their technical knowledge with other engineers and someone who enjoys being part of a team. In addition to a competitive salary your hours will normally be from 9.00am to 5.30pm Monday to Friday, with one hour for lunch. In addition to your 20 days statutory holidays you also get to take the Friday off on the week of your birthday. We are happy to discuss any development programmes you may wish to participate in and most of all you will be joining a friendly team who work really well together. If you feel this role is for you and you think you can make a difference to our business please send your CV to Bryan Corden by email to bcorden@deycom.com and you can learn more about the role by calling 059 9130777.